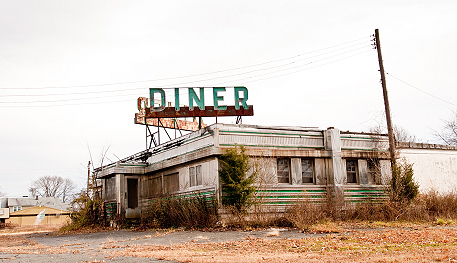 I drove past an old abandoned diner the other day. It is a lonely landmark at the intersection of two state highways, the only building that remains there. I can imagine that at one time, it was a bustling business. However, for as long as I can remember, it has sat vacant. It makes you wonder if someone had a bad business plan, made a wrong move somewhere along the way, and went broke. Given its position at the crossing of two highways, I could argue that something else may have been the fate of this restaurant. I think it may have seen its demise due to changing times. At one time, traveling by car on the state highway system was the best and fastest way to get from one point to another. A lot of state highways went through the heart of small town America. Little diners like the one I described had people in line to be served. I grew up in such a town. My grandmother worked in such a diner. It was always busy. However, times changed with the interstate highway system. Beginning with the signing of the Federal-Aid Highway Act of 1956, a network of interstate highways without stop signs began to take over the bulk of car travels across the state and beyond. Now you had the luxury of traveling without the slow downs of small towns. Traffic patterns shifted. It changed the way we travel and it changed the landscape for business along a state highway. People stopped eating at the local diner and started eating at fast food stops along the off ramps. What happens in your business when the environment in which you work shifts? It happens regularly in business. Software changes. Communication technology changes. Data that used to be saved on a floppy disk, went to a Zip drive, then a CD, that went to a Flash drive, that is now saved somewhere in a Cloud. We have come to expect changes in the tools with which we work. (Even while I have been typing this article, my web site browser was updated to the latest version.) However, I am talking about a bigger shift than we are normally used to. I am talking about the kind of shift that diverts all of your business traffic away from your location on the state highway and onto the interstate. How do you handle this kind of seismic shift? First, it is good to get a fair assessment of what is happening around you. Identify reality. Don’t be the biggest pessimist in business by always bemoaning the fact that the good old days are gone forever. On the flip side, don’t be the optimist that cannot see the reality of a bad situation for the sunshine in your eyes. Right now everyone is trying to be a fortune teller in regards to the economy. When will the key economic indicators look good again? When will housing starts, unemployment, consumer confidence and the value of the US Dollar all come back to levels they were at before the current recession? There are optimists and there are pessimists in that discussion. What is your reality? Take a strong look at your P&L statement. Take time to look at your sales projections. But don’t get stuck there. Take a look at the trends for new business growth around you. Here is an example. At the same time the Eisenhower administration was signing the Federal-Aid Highway Act of 1956, Ray Kroc, the innovation behind the McDonalds franchise restaurants, was putting an idea in motion that would make McDonalds an interstate icon. He began a real estate company that purchased land for future McDonalds restaurants. This was a radical concept. Restaurant franchising was in its infancy in 1956. By purchasing tracts of land, McDonalds could evaluate traffic patterns, future growth and strategically plan the best spot to erect the golden arches. But the real business genius behind buying land was that it became another source of income for the McDonalds Corporation. Now they were more than a franchiser, they were the landlord. This became the real cash cow for the McDonalds Corporation. By 1960, they had 200 franchisees, all paying the franchise fee and rent. By 1965, there were 700 franchise locations. By 2003, McDonalds held over 31,000 sites in 119 nations. Ray Kroc understood the shift that was happening in traffic patterns. He also saw an opportunity for business growth and took hold of it. What about your business? Are there ways you can envision bringing income through your doors that is dictated by a shift in the way business is going to be done? Step back, take a look at the changes that are happening around you and think beyond the way things have always been done before.